A bizarre legal battle is playing out in Romania right now, as the Romanian Orthodox Church is fighting for the right to use the name and image of Elder Arsenie (Boca), a faithful son of the Church, against a private individual who owns the right to use the elder’s name and image that were trademarked with the European Union Intellectual Property Office. 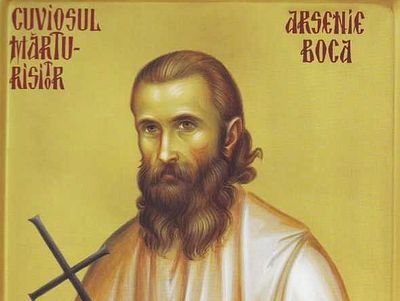 Elder Arsenie, who reposed in 1989, was one of the great Romanian spiritual fathers of Communist times, and is revered today as a saint, although he has yet to be canonized. Thousands go on pilgrimage annually to his grave at Prislop Moanstery in Silvașu de Sus, and images of him are seen as a blessing. At least one such image, bought at Prislop Moanstery, began miraculously weeping in May 2015. A miracle is known to occur at his grave as well: Even though the temperatures there can be extremely low, often reaching -5 degrees, all of the flowers that have grown on his grave neither wither nor freeze and die by the extreme temperatures but instead remain in full blossom. From winter to summer, the elder’s grave remains full with blossomed, multi-colored fragrant flowers. But now those beloved images are being confiscated by the police, Balkan Insight reports. Police have been called to the monastery twice this year, and also to a shop in the western city of Arad in May. Daniel Gheorge, one of the two owners of the Fr. Arsenie trademark, complained to police that the monastery and shop were selling images of Fr. Arsenie without the proper license. Through his lawyer, Gheorge has made more than 100 complaints against churches and stores. Interestingly, Gheorge is not even an Orthodox Christian, but is rather a Baptist. The other owner of the trademark is an ethnic Hungarian. This has only increased the public’s outrage. An article on tech2.org explains that George obtained the right to use the Fr. Arsenie trademark from a British company that had registered it with the European Union Intellectual Property Office. The site archyworldys.com writes that that company is Additional Woldwide Which Service LTD, owned by Hungarian Andor Sandor. “He belonged to us, to the people. He is close to our hearts. He should be left to the Church,” one Romanian Orthodox faithful told Balkan Insight. “Using this for making money? How is this possible? Romanians come here to pray for their souls. They pray to Arsenie Boca,” another explained. However, Gheorge explains that he decided to trademark Fr. Arsenie’s name and image because no taxes are being paid from the black market of such goods, which he says is worth 40 million euros ($46,517,840) a year. He did not explain why he believes public shops are not paying taxes. In another twist, Gheorge’s lawyer is an Orthodox Christian who believes that were he alive, Fr. Arsenie would be glad to be represented by him. The lawyer, Lucian Buzlea, explains that Gheorge and his partner wanted to stop people from getting rich off of Fr. Arsenie who had no connection to him. He goes on to explain that the same could be said about the Baptist Daniel Gheorge and the Hungarian Andor Sandor, but in their case, Gheorge is bringing the black market to light. The trademark owners are currently looking to sell it to an investor. Tech2.org also reports that Gheorge has actually been fined 200 leu ($50) by police for abusing the 112 emergency hotline to turn in churches and stores. The Romanian Orthodox Church has initiated a lawsuit against the trademark owners, and is considering speeding up the inevitable canonization of the great elder in order to resolve the issue more quickly. The Church reasons with his glorification, his name will change to St. Arsenie, and icons will be made of him, and thus his name and image will no longer fall under Gheorge’s trademark. However, lawyer Iulia Burbea Milescu believes the Church and state should instead appeal the trademark, and that they would easily win. She argues that if the Church resolves the issue by changing the elder’s name and image, they are implicitly conceding Gheorge’s right to own his current name and image. 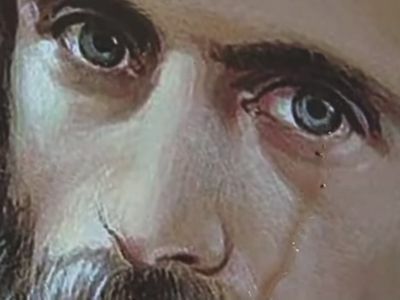 Residents of the Romania’s Vaslui county are convinced that late Hieromonk Arsenie (Boca; 1910-1989, a prominent elder and confessor) is truly working miracles.